SIDE EFFECTS: A brief sensation of warmth or stinging may occur immediately after applying the medication. Skin redness, dryness, itching, scaling, mild burning, or worsening of acne may occur during the first 2-4 weeks of using the medication. These effects usually decrease with continued use. A daytime moisturizer may be helpful for excessive dry skin (see Notes). If any of these effects persist or worsen, notify your doctor or pharmacist promptly. 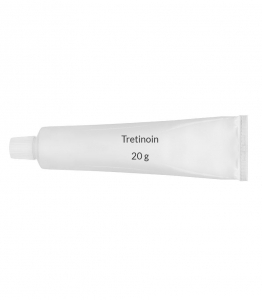 Your doctor may want you to decrease how often you use tretinoin, change the strength or type, or have you stop using it. Remember that your doctor has prescribed this medication because he or she has judged that the benefit to you is greater than the risk of side effects. Many people using this medication do not have serious side effects. Notify your doctor if you experience: blistering, crusting, severe burning/swelling of the skin, eye redness and watering (conjunctivitis), eyelid swelling, skin discoloration. A very serious allergic reaction to this drug is unlikely, but seek immediate medical attention if it occurs. Symptoms of a serious allergic reaction may include: rash, itching/swelling (especially of the face/tongue/throat), severe dizziness, trouble breathing. This is not a complete list of possible side effects. If you notice other effects not listed above, contact your doctor or pharmacist. In the US - Call your doctor for medical advice about side effects. You may report side effects to FDA at 1-800-FDA-1088. In Canada - Call your doctor for medical advice about side effects. You may report side effects to Health Canada at 1-866-234-2345. OVERDOSE: If overdose is suspected, contact your local poison control center or emergency room immediately. US residents can call the US national poison hotline at 1-800-222-1222. Canadian residents should call their local poison control center directly. This medicine may be harmful if swallowed. Symptoms of overdose may include excessive redness, peeling, and discomfort.